Erin continues to bloom in all of her farm ventures and due to popular demand has asked Moose Manor Farms to host a SoMD edition so that our southern farms can more easily participate. Moose Manor has taken this guidon and we are so excited to announce that we'll be hosting the fall swap going forward. This swap meet is located in Southern Maryland just 30 minutes south of DC but we expect to see so very many of our long time swap friends down here and heartily welcome all DELMARVA farms and crafters who want join in... Friday afternoon set up is A-OK! Unfortunately, due to unforeseen circumstances camping will not be available this swap. our hatching officially starts in April. Add your name to the waiting list for upcoming babies. Chicks, ducklings, keets & poults are available straight run only. The minimum order is 3 chicks/ducklings. Pilgrim Goslings are autosexing and may be ordered by gender, with a minimum of 2. You may mix and match. I sell out of babies quickly so adding your name to the waitlist will greatly increase your chance of getting them this season. Prices subject to change; Availability subject to Mother Nature. Zero Registrations available? 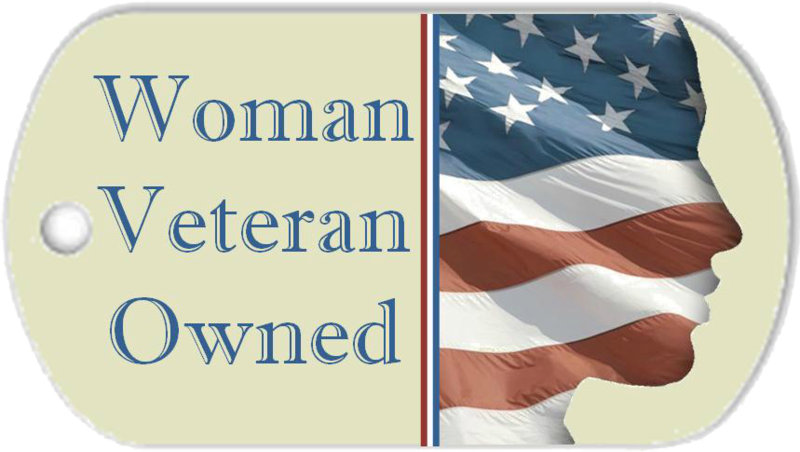 Click here to be added to the waiting list. Preparing a goose for a special holiday dinner is a time-honored custom across many cultures but has become a rare pleasure in America. With turkey in abundance here,it's certainly narrowed the availability of dressed geese for our holiday tables. Revisit this venerable tradition with a lovely goose for your celebration feast, you'll certainly decide that it's far too wonderful to serve only once a year! 5 Production Layer Duck Hens $20 ea. 2 Black Indian Runner Drakes $10 ea. Humanely raised on pasture without grow-lights, antibiotics or pesticides, roasters average 3.5 lbs. Rabbit is one of the healthiest meats available: it’s tender, lean, delicious and as versatile as chicken, to which it can also be compared in taste. Extremely lean, the calories in rabbit meat are low - a 3-oz. serving is a mere 147 calories. Additionally, it provides more protein than beef or chicken, a concentrated source of iron, and has a higher meat to bone ratio than chicken. The meat of rabbit is fine-grained, generally mild, and faintly sweet. It's slightly earthier than chicken, with the woodsy herbal flavor of juniper, thyme, and sage. Though elusive to describe, this simple fare has a flavor profile that's subtle but complex. Today, we’re in the midst of a rabbit renaissance. Chefs and home cooks who've been influenced by the nose-to-tail philosophy, and who are interested in practicing sustainability are discovering that rabbit is right in so many ways. Chefs prepare the meat similar to chickens. Rabbit steaks and chops are served with pasta, rice and sauces. If you're cooking rabbit pieces, try the saddle or loin, which are the tenderest cuts. The hind legs will benefit from a slow, moist cooking, like braising. 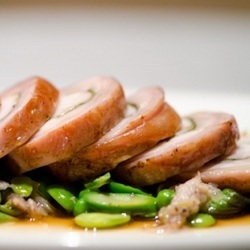 Your ultra lean rabbit meat is excellent with bacon, or ventreche, to add some fat and protect it during cooking. So don’t be shy with the duck fat, olive oil, or bacon. Black Cayuga Duckling $7 ea. Hatched out under one of my many broody Buff Orpington Chickens last week along with two Welsh Harlequin ducklings. All 3 are Holderread line and are living happily with their chicken mama for now. These ducks love to swim! They're just so much fun to watch because they have a great time in the water. These ducklings are the quietest of the bunch, they just want you to point them to the swimming hole and they're happy. The Cayuga, to this day, is recognized as one of the hardiest of the domestic ducks and are easily tamed if hand-raised. They tolerate the harsh winters of the northeast and can produce many offspring. The Cayuga averages 7-8 lbs. and has the ability to obtain much of its diet from foraging, when given appropriate areas to explore for food. . The meat of the Cayuga is flavorful with a fine quality. They are good layers of 100-150 eggs per year that can be used for general eating and baking. Eggs are initially black in color, but as the season progresses the shell color lightens to white by the end of the season. The plumage of the Cayuga is uniformly black that shines with green iridescence and females may become mottled with white as they mature. This duck is listed as threatened by the American Livestock Conservancy. The Cayuga is in a good position to rapidly increase in number with little effort. Only a few additional breeders are needed to help further secure its future. Learn more about the Cayuga breed here. All birds sold for pick up here on the farm, straight-run only, minimum duckling purchase 2 of any breed. The males are large, weighing up to 20 pounds, with the smaller females reaching about 9 pounds. Some people consider them ugly because of the large red warty caruncles above the beak and around the eyes. However, they are very calm, quite intelligent, and extremely sweet natured birds that often described as "friendly as a puppy." It almost seems that the Muscovy are trying to "talk" when they come up to you, wag their tails like a dog, and look up at you as if to say, "Got a treat?" Muscovy meat is one of the healthiest meats on the market today, being 98% or greater fat free. Many people say that the breast meat of a Muscovy is hard to tell from a Sirloin steak. Famous chefs know this and use Muscovy meat in a number of ways. Being so lean, meat from the Muscovy duck is not greasy as is the case with other ducks. Some say that the meat tastes a lot like expensive ham, others say it is hard to tell from veal. Preparing a goose for a special holiday dinner is a time-honored custom across many cultures but has become a rare pleasure in America. With turkey in abundance here, it's certainly narrowed the availability of dressed geese for our holiday tables. Revisit this venerable tradition with a lovely goose for your celebration feast, you'll certainly decide that it's far too wonderful to serve only once a year!. Raised Free & Humanely without grow-lights, antibiotics or pesticides, this is "slow food" at its finest! These geese will be harvested young at approximately 8 - 10 lbs to ensure a very tender bird for your table. Goose meat is dark, juicy and quite luxuriously flavored. These birds are naturally hatched and raised by their mother goose on free-range with room to roam, graze, and splash so that they're significantly lower in fat than commercial birds, resulting in a meat of voluptuous flavor and lush texture. 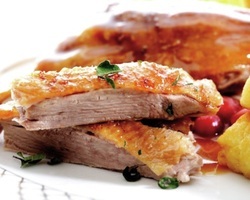 Try roasting and serving these savory geese with a tart citrus sauce, the piquancy provides a wonderful balance.